Judging value: Victor James Menezes says the market is overpriced in general and it is highly over-priced in some specific cases. 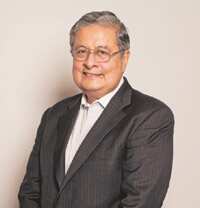 Mumbai: When Victor James Menezes, 60, senior adviser at private equity (PE) firm New Silk Route Partners0 Llc (NSR), visits Mumbai, he stays with his 87-year-old mother and catches up with old friends from his Citigroup days. The former senior vice-chairman of Citigroup Inc. spent 32 years with the US bank before retiring in January 2005. He was in Mumbai early last week for an offsite meeting with NSR’s employees and clients. As a PE firm, what has been your experience in India so far? We raised about $1.4 billion (Rs6,510 crore) and have invested roughly a third of it. So we still have a lot of firepower left and I think our partners have learnt to make use of those resources. We are not just a money shop that writes a cheque and hopes to get a return. We look to participate in building a company. The expectation of Indian promoters are high. The market, too, is beginning to look overpriced. What’s your message to the promoters? The market is overpriced in general and it is highly over-priced in some specific cases. So, we just have to go through negotiations and discussions and come to a consensus in terms of what value you can create, which is opposite to the practice years ago that was based on optimistic projections. The trick is structuring it in a way that both parties win. Will buyouts take off in India? It will, but a lot slower. There is much more willingness now among entrepreneurs to bring in private equity, which is truly growth capital. They see it as an opportunity to make connections and get international experience if the PE is a foreign one. Your experience has not been good in terms of investments in media and financial services sectors. Wrong call made in a bit of a hurry? It would be too pessimistic to believe that. (The) financial services deal is very much work in progress. We are very happy with the state of our portfolio. It has to mature. I don’t want to get into a discussion on specific companies, but certainly on the financial services side, it’s too early to tell. There were many interesting deals. Actually, we passed a lot of financial services deals as they were very overpriced. We have interests in telecom, manufacturing and consumer goods and have several verticals in mind. In telecom, there are many new players coming in who will need funds. Is the telecom sector attractive enough for Indian private equity firms? What sector could attract investments? Infrastructure, especially power and FMCG (fast moving consumer goods). How does the deal pipeline look like in India? There seems to be a lot of transactions in the pipeline. We can actually see a pick-up in the deal pipeline. We have seen it in manufacturing, power, healthcare and two or three deals in financial services. Eight of the 10 deals were in India (out of the Asia Fund). How different is your experience in the PE fund from Citi? In Citi, it was a full-time position. Here at NSR, it is different. But in terms of dealing with companies, issues, people and restructuring and financials, it is a lot similar. Also, I deal with people from my previous career. In that sense, there is a continuity. Do you think Indian regulations stifle entrepreneurs? Indian markets have always had more than its share of regulations. We can run a good business and make money playing by the rules. We have one of the most regulated banking environments in India. Citibank has done extremely well here and so has the banking system. Citibank has made more money in India than they have made in China. What do you think of the evolution of sector-specific funds in India? Different strokes for different folks. If you come from a certain background and if you have that knowledge and domain expertise and the focus that sector-specific funds have, it makes sense to focus on the areas that you are an expert in. However, we have taken a different approach as we have people who have experience in a number of sectors. So we could play a little bit more broader role. But both models can work.